“Chilling Adventures of Sabrina” will return with a holiday special later this month — and Season 2 next spring. Less than six weeks after Season 1 launched, Netflix has revealed its Kiernan Shipka-led take on the Archie Comics half-witch, half-mortal teen’s tale will return with its second installment on April 5, 2019. 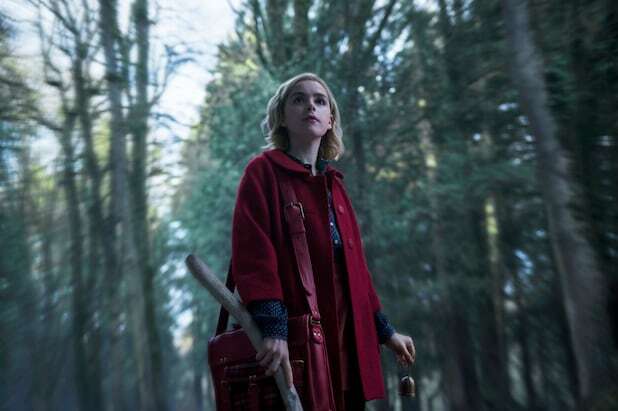 In a new 44-second teaser released Saturday, the now platinum-haired, dressed-all-in-black Sabrina (Shipka) is taking a walk on the wild side and embracing her dark new life after signing the Book of the Beast. The video (set to The Runaways’ “Cherry Bomb”) shows the 16-year-old heroine dancing sensually with Prudence, the other Weird Sisters and Nick Scratch (gasp!) at the Academy of Unseen Art, Sabrina’s ex Harvey and her best friend Roz looking cozy in the Baxter High hallways (more gasps! ), and Sabrina and Harvey kissing again (extra gasps!). Aside from the personal teen drama brewing ahead, the clip includes the young witch coming face to face with a wolf in the woods and pouring gasoline all around the halls of her old high school and lighting a match with a demon’s encouragement. Oh, and Miss Wardwell aka Madam Satan is back and looking more wicked than ever. Meanwhile, Aunt Hilda is getting all dolled up and Aunt Zelda seems more than a little concerned with Sabrina’s new attitude. And Ambrose is being his usual cool self, of course. The teaser concludes with the warning, “Get ready witches,” and a title card that reads, “Chilling Adventures of Sabrina” Part 2 — April 5, 2019. But don’t worry, you won’t actually have to wait that long for more “Sabrina,” as the holiday episode — “Chilling Adventures of Sabrina: A Midwinter’s Tale” — drops Dec. 14. And if you want some scoops on Season 2, you can read TheWrap’s recent interview with showrunner Roberto Aguirre-Sacasa about the next batch of episodes here.